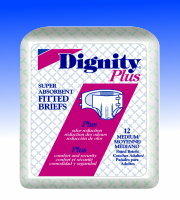 Disposable, absorbent brief for both urinary and bowel incontinence. Fits the larger child - waist sizes 22" - 36"
For moderate to heavy bladder and/or bowel control protection. Features the InstaDri Skin-Caring System™ to improve surface dryness and promote healthy skin while reducing leakage. The transfer layer permits fluid to almost instantly enter the dual core, helping to promote skin dryness. The Dry-Fast Dual Core™ technology rapidly wicks fluid away from skin trapping it into the lower core for greater security and increased skin dryness. Strategic placement of Super Absorbent Polymer improves fluid absorption. Superfit™ Re-fastenable Tape Zone allows for multiple repositioning of tape tabs for a better fit with less waste. 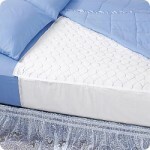 Soft nonwoven backsheet is gentle against skin and less noisy, providing improved comfort and dignity. Latex-free. Available by the Case of 8 Bags of 12 briefs.